Jimmy Stewart had a career. Started out in the 1930s as a sort of everyman in light comedies and Frank Capra films, with a natural charm accentuated by gangliness and height. Played a couple romantic leads, an idealist or two, won an Oscar, then took five years off to do his part in World War II. When he returns, he suddenly seems to favor darker material – It’s a Wonderful Life, Rope, and Winchester 73. Now and then he gives a glimpse of his old ways, popping up in Harvey, bio-pics like The Glenn Miller Story, and the ultra-frivolous, The Greatest Show on Earth, but no matter what else he did, it’s that cynical streak of films he took with after the war that defines Jimmy Stewart for us today. But given the slow return he had to the screen after World War II, appearing in just one film each in 1946 and 1947, after doing 3 or 4 films a year before the war, that means his third after the war – Call Northside 77 – feels like the start of this new period in his career, when he did turn to cynical films. And yet, if one thing stands out about Call Northside 777, it’s that no matter how cynical it might be, it is ultimately hopeful. At the height of prohibition, a Chicago policemen is gunned down in a speakeasy. Two men are quickly arrested, and convicted, based on the eyewitness testimony of the speakeasy owner. Eleven years into their life-sentence, a cryptic ad is placed in the newspaper, offering a $5,000 reward for finding the true killers. 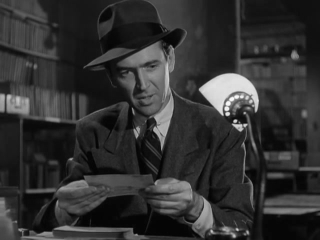 An editor at the paper (Lee J. Cobb) is curious about it and so send his best reporter (James Stewart) to investigate. It turns out the ad was placed by the mother of one of the convicted men, who swears her son is innocent. Initially pessimistic on finding the ‘true’ killers, the reporter follows the story, but only so he can sensationalize it and make it a good story. Eventually, though, he is roped into the investigation, eventually turning up evidence that clears the men. Given the bulk of Jimmy Stewart’s career in the 1950s was spent bouncing between westerns, and Hitchcock films, both of which have some narrative drive, it’s surprising how methodical Call Northside 777 is, and also how lackadaisical. In many ways the film is something of a proto-procedural, with the reporter essentially following the various threads of the investigation, some of which are not at all helpful, some of which pay off. But like the procedurals on TV today, which tend to be flashy and have some drive – or, curiosity about what they’re doing – this one is much slower and methodical. This easily could have been a 60 minutes, at most, but instead is stretched out to 111 minutes. It also isn’t all that flashy – in fact, it’s something of an anti-flash movie, and very visually dull. But what’s interesting about this procedural is that, unlike a movie where the investigator is very good at his job, the reporter here is not. Or doesn’t seem to be. Yes, he’s good at the writing part of reporting – his articles all make the front page, and they certainly kick up a fuss. But he’s lousy at the investigation portion of being a reporter, particularly in terms of being all that probing, or interested in, the people he interviews. For instance, when Stewart meets one of the convicted men at the prison – by the way, it’s completely unbelievable how easy it is to schedule a visit, and how casual and sit-down-in-the-warden’s-office it is – and the interview lasts no more than five minutes. The reporter barely asks any questions, asks even fewer follow-ups, and more than that, doesn’t write anything down. But why would he when there’s nothing to write down? To be fair, I don’t expect fictional films to adhere to complete fidelity in everything they show – we don’t want a dry recitation of how the reporter does his job, because that’s not cinematic. But, that doesn’t absolve a film of at least trying to get some of the things right. And too often, this one doesn’t bother. If there’s anything the film gets right – or feels like it gets right – it’s this: the extent to which a reporter can be beholden to his own preconceived notions of a story, in both the good and bad ways. Too often the reporter here has made up his mind what the story is before he’s even started, and is only poking deep enough to seemingly-confirm his narrow version of events. And once he gets it, he stops, uninterested in having to construct a new narrative that might be based on the actual truth. Of course, the flip side of this is that, when he can’t find the items that confirm his narrow version of events, he does keep digging for them, until he finds it out, in this instance being his belief in the innocence of the convicted me. I suppose the other thing Call Northside 777 gets right, and which All The President’s Men also shows us, is that to be a good reporter, it helps if you believe what you’re writing. It also doesn’t hurt that you’re willing to lie, and deceive, people, because sometimes that’s about the only way you’ll get anything out of them. A caveat here: I’m an attorney. I mainly practice family law, though occasionally mix in some criminal defense and other what-have-you’s. Importantly, I am not an attorney in Illinois, nor was I one practicing in Illinois in 1940, handing criminal/appellate style work. What all that means is I don’t have a good reference point to work from when it comes to Illinois criminal and civil procedure – some of my law school classmates currently practicing in Illinois are probably better situated than me on that one. Nevertheless, the legal procedures used to spring the convicted man from jail here do not pass the sniff test, not even if a broad way. As drama, it all works on film, but to me the steps they all take to get there seem so divorced from reality that it almost feels like the movie makes up the inner-workings of Illinois law, then bends it around as needed to come to a pre-arranged ending, just for the sake of the movie. It might be the ‘ecstatic truth’, but don’t even mistake this as any sort of actual truth. It probably should share this assessment with The Naked City, which was released March 4, 1948, just one month after Call Northside 777’s February 1, 1948 release. Also, while detective movies had already existed, they were either noir films first (The Maltese Falcon) or comedies (The Thin Man), with the actual mystery and procedure secondary to all else.